Simply magnificent in any decor. 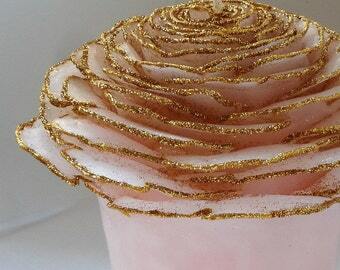 Ready to ship: One of a kind, pure beeswax Rose Garden Pillar Candle in graduated shades of hand-dyed purple, adorned with air-dried rose leaves dipped in beeswax to seal them in place. Long burning, with a delicately fragrant, natural honey aroma. Once the core burns down as far as you want, reuse indefinitely with votives or tea lights. 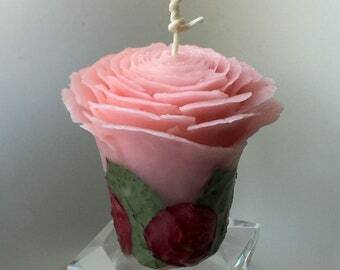 My "Garden" style candles resemble roses in full bloom. 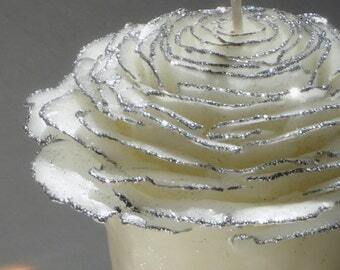 Using my original designs and techniques, I handcraft each candle to be an individual work of art. No two candles look exactly the same. Looking for an extraordinary gift you can't find anywhere else? 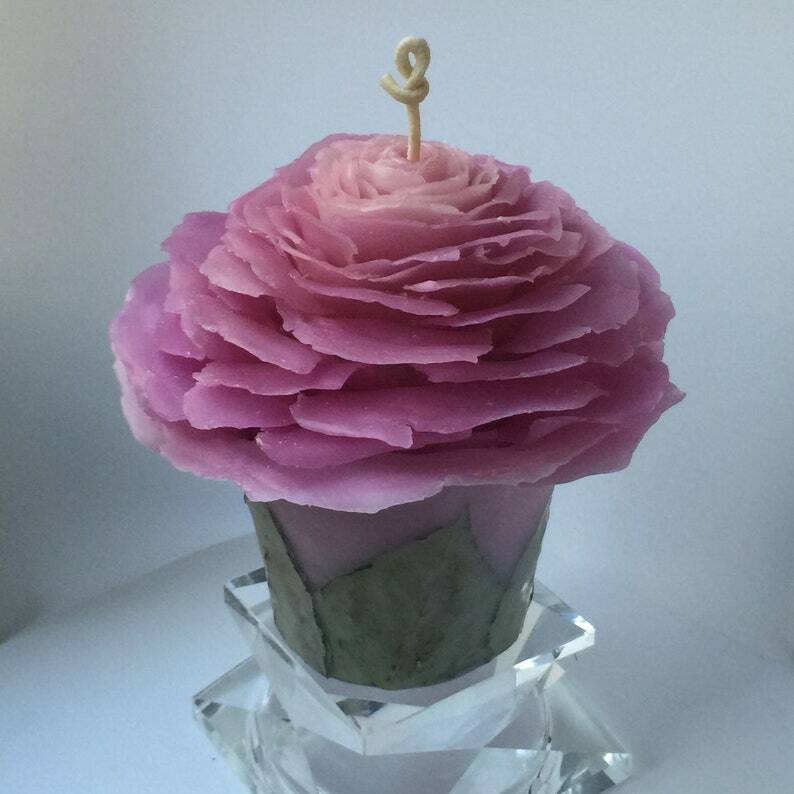 Imagine their surprise and delight when your recipient opens the gift box and sees this exquisite candle! Also available handmade-to-order in other colors and sizes in my Etsy shop or by request. 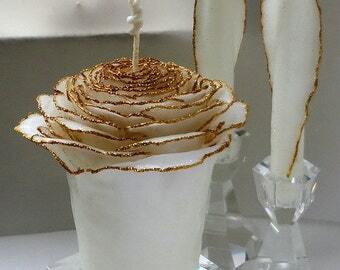 "This candle is simply gorgeous! It's composition and color are so unique. Marcie is a true artist in design and execution. Beautifully and securely packaged as well. It's going to make a wonderful gift. Thanks again Marcie." 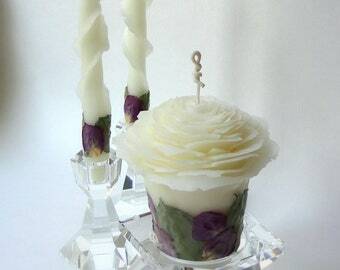 "These candles are the perfect addition to our wedding ceremony. The rose candle is exquisite. So are the tapers. Exactly what was envisioned." 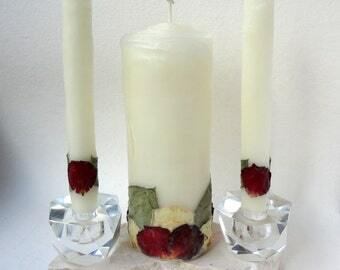 This listing is for the candle only - Holder is not included. Tapers are handmade to order and can be added to your order if desired. This item's purchase price includes shipping via USPS Priority Mail with tracking & insurance, usually 3 days delivery time but can take up to 5 days. Guaranteed overnight delivery (2 days to some locations) via Priority Mail Express is available during checkout for an additional charge.